Ever since I visited Robinsons Magnolia during the opening of Yabu's branch there, I've had a fascination with the mall. Around half the stores aren't open yet, so the place isn't too congested, and even parking is very accessible (not to mention at the moment, free!). Of course, once the mall begins to fill up with more and more stores, things will change, which is why i'm savoring every moment of it while I can. Rina wanted to take Baby Rain out for the day, so I thought a trip to Robinsons Magnolia would be a nice change of scenery for her, because we usually take her to Bonifacio High Street (Of course it probably wouldn't make a difference to her). There's a nice garden area that Rina thought Baby Rain would enjoy, as she's slowly learning how to walk. 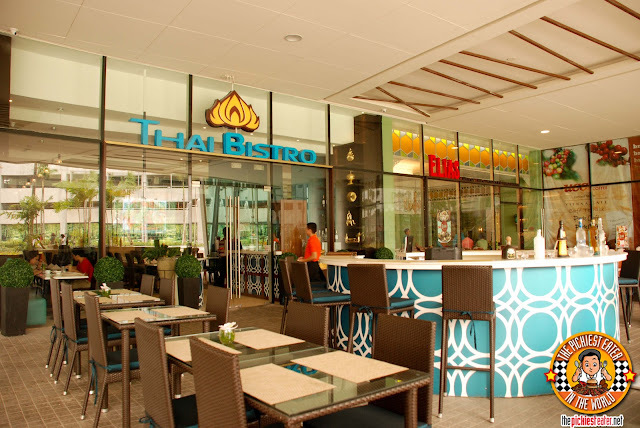 Right in front of that garden area, we spotted a restaurant that I hadn't noticed before, called "Thai Bistro". 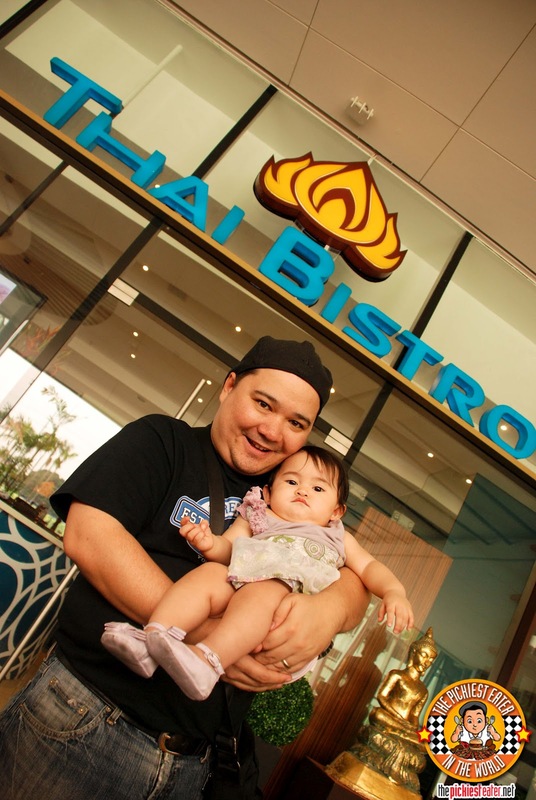 After a few minutes of walking around the grass with baby Rain, Rina and I decided to give this Thai Bistro a try. Chef Cecille told us that if there was something we wanted that wasn't in the menu, and she had the ingredients for it, she would be more than happy to prepare it for us.. Which I thought was awesome. Case in point.. Chef Cecille asked Rina what kind of food Baby Rain eats.. and then within minutes, she made a soup especially for her! Inside, the beautiful, yet simple interiors that successfully invoke the spirit of Thailand, yet giving it a contemporary feel. The culture of the country is evident, yet you don't look like something straight out of the pages of National Geographic. I've mentioned before that I don't drink Milk Tea, right? In fact, it wasn't until I tried Da.u.de Tea Lounge that I found a Milk Tea that I actually enjoyed. 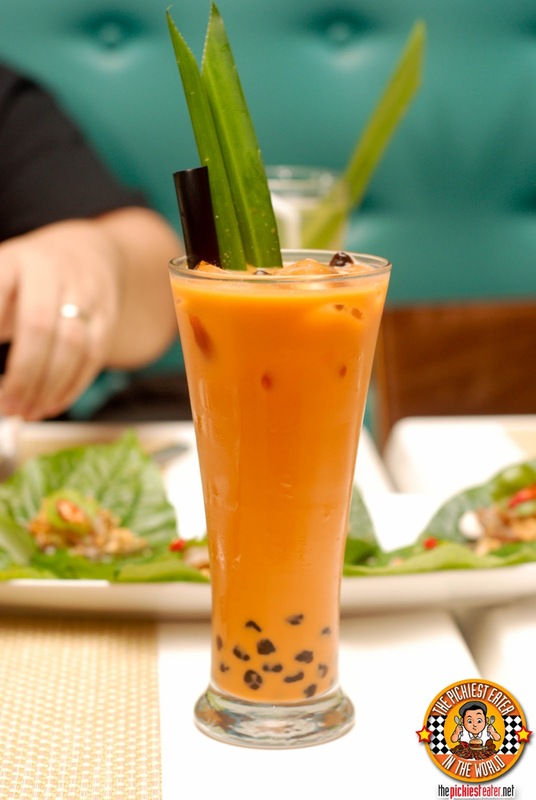 Well, Thai Bistro's Thai Milk Tea (P110) now joins those ranks. It had a nice creaminess that overcame the aftertaste of tea that I don't like so much. Rina was the one who ordered this, but for some reason it kept finding its way to my spot of the table. Apart from Macaroni and Fruit, I'm really not a big salad guy either. 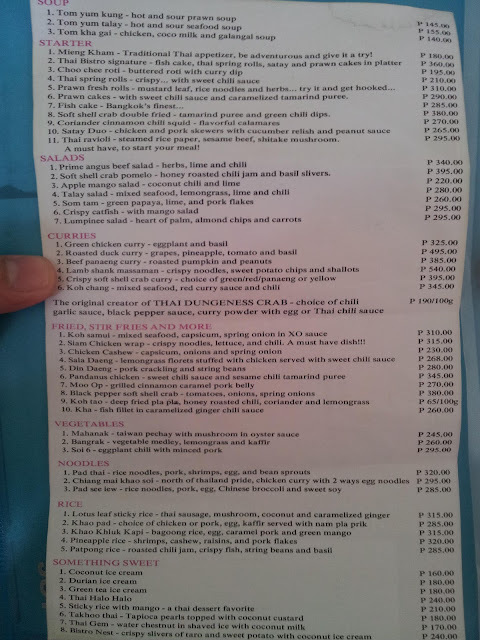 But I really do enjoy good catfish, so when I saw the Crispy Catfish (P295) on the salad menu, I had to order it. Chef Cecille explained that some restaurants may add a little flour in the salad as an "extender" but Thai Bistro's version is made with 100% pure catfish.. And it shows. It was fried to a beautiful crisp, almost reminiscent of "Adobo Flakes", and it comes with a side of Mango Salad. Truth be told, I could eat this plain with garlic rice, and i'd be good. 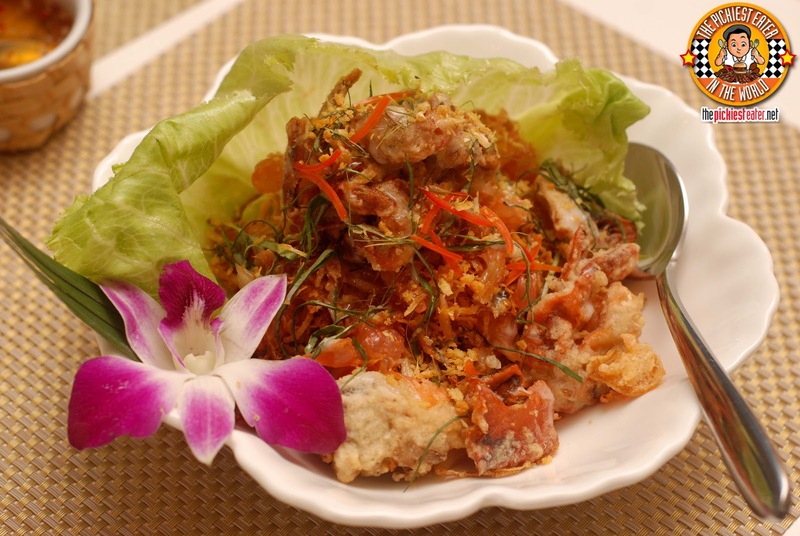 Rina, on the other hand, wanted to give the Soft Shell Crab Pomelo Salad (P395) a try. 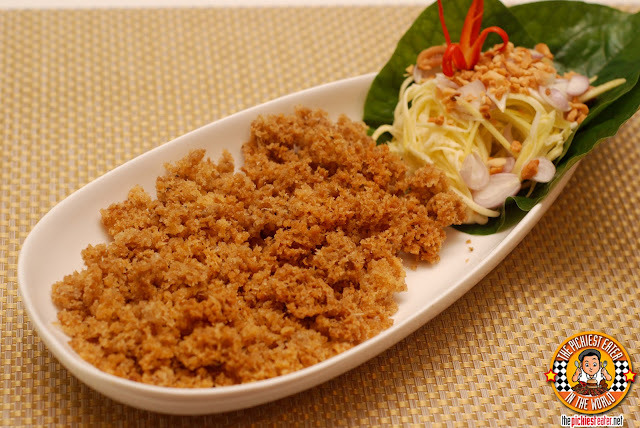 The fruity taste of the pomelo, compounded with its natural acid, bounced off well with the tinge of spice that the crab. I was intrigued when I saw "Thai Ravioli" (P295) in the menu. A nice twist on the Italian classic, instead using Asian ingredients to create a whole new experience for your tastebuds. Slicing open the Ravioli revaled a mixture of flavorful beef and shitake mushrooms, carefully enveloped in a delicate rice paper wrapper. It was fantastic. Shen mentioned that no meal in Thai Bistro is complete without an order of one of their signature dishes, the appetizer called Mieng Kham (P180). Shen mentioned to Rina that there's shrimp in it, and that was all she needed to hear for her to order it. The waiter brought out a platter, filled with leaves that had some stuff piled up on top of it. 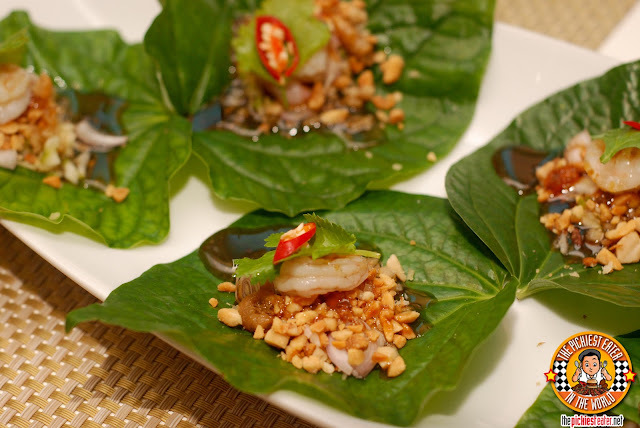 Chef Cecille told me that you would be hard pressed to find the "Betel Leaves", used in her Mieng Kham here in the Philippines, because it's usually only found in Bangkok. Chef Cecille brought the plant with her from one of her numerous trips, and it now grows in the backyard of her family home, and is hand-picked every morning. 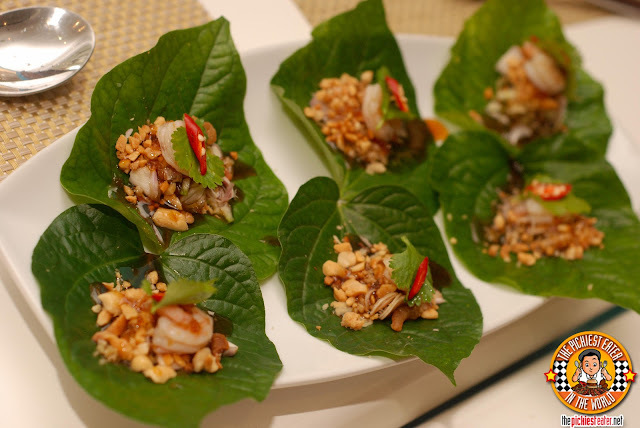 Mieng Kham is a mix of sliced ginger, chalots, peanuts, dried shrimp drizzled with a special sauce, topped with chili for added spice. Rina made the mistake of eating the whole thing with the giant slice of chili on it. Her resulting face made her look like she had just swallowed the sun. Mieng Kham isn't something that I'd normally order but I gotta say, it was really quite good, and i'm glad I got to try it! Judging from the name, you can't blame me if I was half expecting the Patpong Rice (P285) to come with Pingpong balls (but in hindsight, thank god that it didn't!). This was an extremely flavorful dish, filled with bits of crispy fish, string beans and given a spicy kick by the roasted Chili Jam. 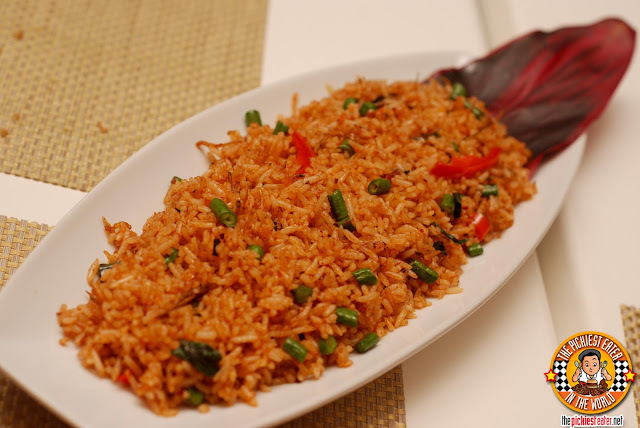 I really loved this fried rice and it can stand as a meal in itself! Another thing Shen suggested we try was the Black Pepper Soft Shell Crab. As I mentioned before, I don't usually eat crab, so I caught myself by surprised when I realized our meal consisted of not one, but TWO crab dishes. 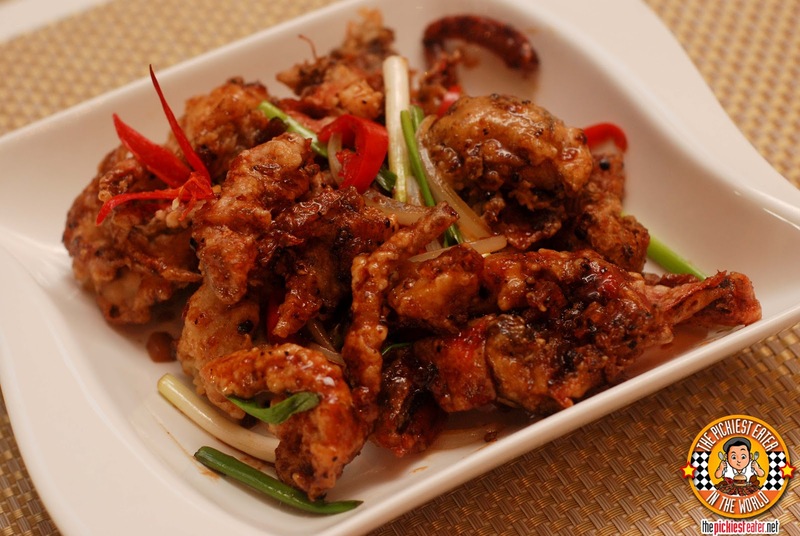 Our second crab dish for the evening was the Black Pepper Soft Shell Crab (P380). The black pepper added some punch to an already flavorful crab, and the heat wasn't overpowering at all. One of Rina's favorite Thai dishes is definitely Green Curry, so I knew from the start that she would want to try Thai Bistro's Green Curry Chicken (P325). This was nothing short of amazing. It was a bit different from the curries from different Thai restaurants i'm used to. It was milkier.. It was creamier.. It was actually among the best I've ever tried. If they could just temper the heat a little bit, It would have been perfect. 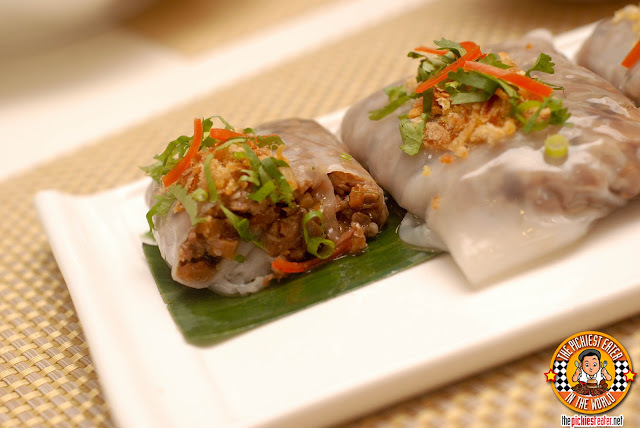 When we dined earlier this year in Krua Thai Cebu, I was impressed with the Pad Thai that was wrapped inside an egg. I thought it took notable technique and skill to get those noodles tucked neatly into the egg wrapper. 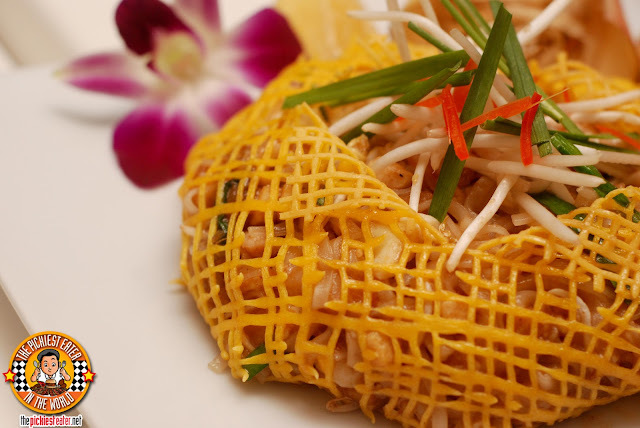 So imagine how I was floored when I saw the intricate care put into creating a mesh made of egg, which would serve as the wrapper for some delicious Pad Thai (P320). It was funny because, the dish was so beautiful, Rina and I didn't wanna touch it! we were worried we would ruin it or something.. After passing by our table numerous times, Chef Cecille finally came up to us and said, "I'm going to mix this already, because if you don't eat it soon, it might go dry!". The funny thing is, we had a little bit leftover, so Rina and I had it for dinner later that night.. trust me, it didn't go dry and was just as delicious! 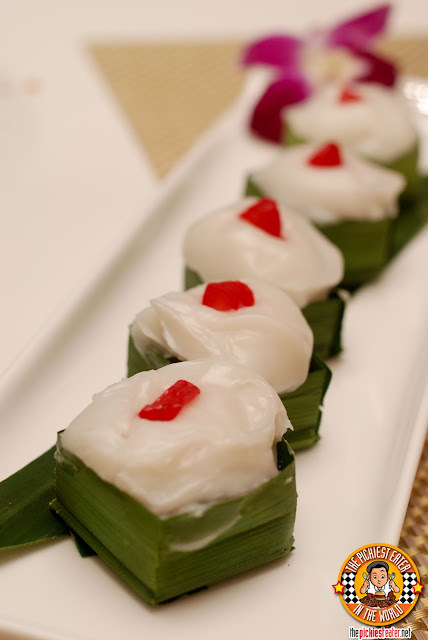 Yet another dish that showed exceptional technique, was the Sala Daeng (P268). 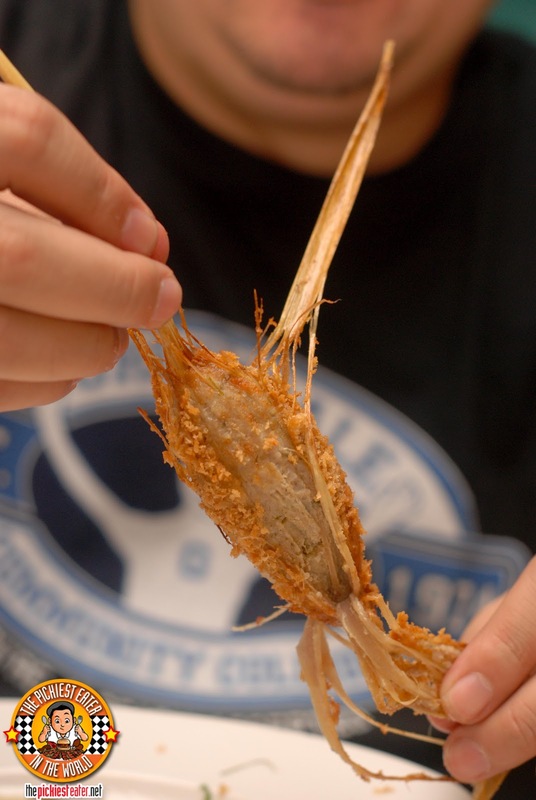 This was Lemongrass Florets that were stuffed with ground chicken making them look like ammo for a bazooka. Good thing Chef Cecille was nearby because she showed me how to get the meat out of the darn things. Before she came along, I thought I would need the help of Robert Langdon to get it open. 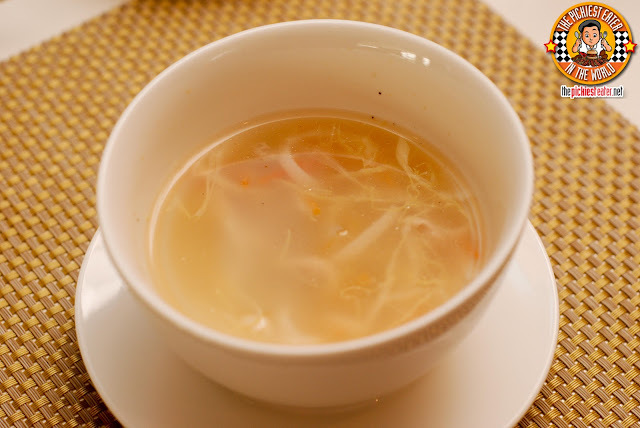 When you get the chicken meat out, you're in for a delicious treat, as the fragrance of the lemongrass added to the amazing flavor of the chicken. 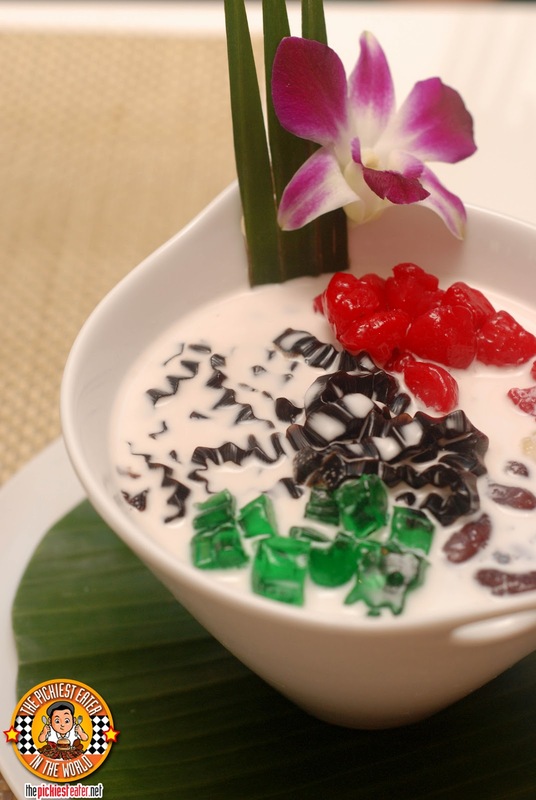 Rina ordered the Thai Halo Halo for dessert, and again, she was blown away with how the gelatin came in jagged shapes. 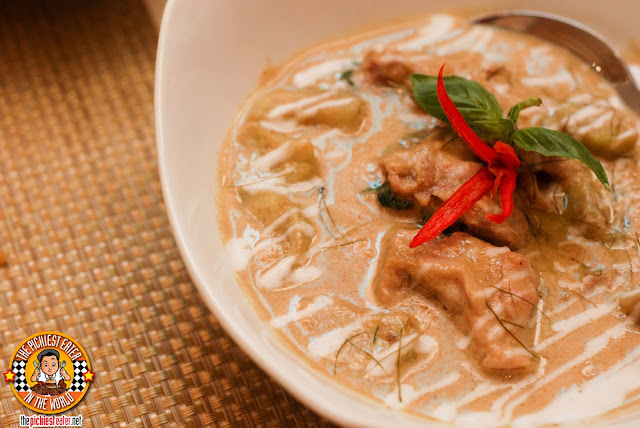 These are things that you might not even notice when you dig into your bowl with reckless abandon, yet Thai Bistro took the time to carve it out for a little added aesthetics. Rina enjoyed the great mix of Sweet and creamy. 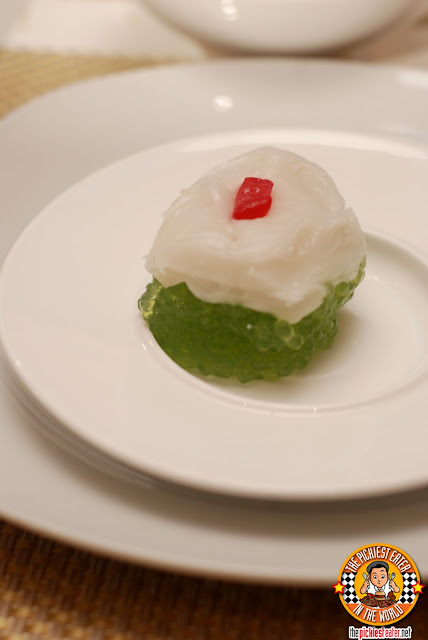 For a guy that doesn't usually like coconut, I really adored the Takhoo Thai (P180), which features two parts.. a rich coconut custard topping..
And a bottom base of tapioca pearls. Maybe my palette is off here, but what I enjoyed about this, was how the Coconut custard seemed to be creamy, and sweet, yet capture a small salty kick at the same time. All of these flavors made sweet music in my mouth, and was the perfect way to end the meal. I can safely say that Thai Bistro is the most innovative Thai restaurant I've ever been to. 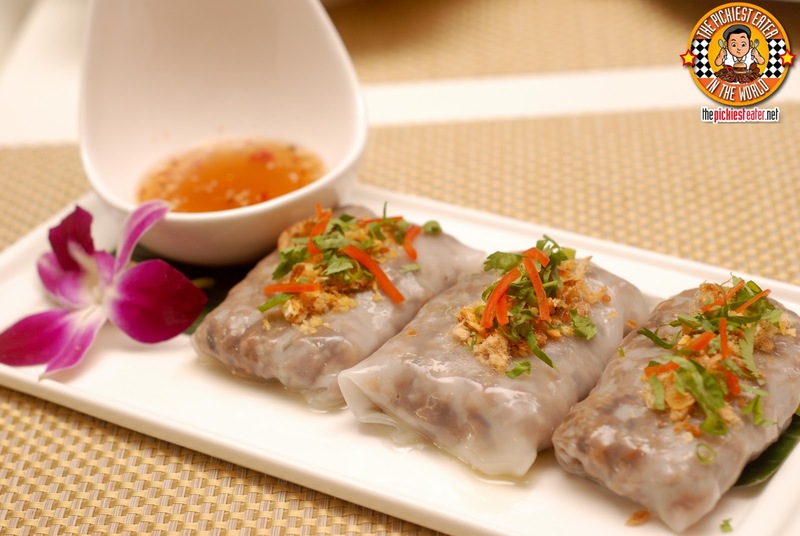 You don't have to be a food enthusiast to appreciate their dishes. Some are complex and clearly tedious to create, while the other dishes are the personification of classic Thai dishes.. But all are absolutely delicious. The nice attendants saw Rina having a hard time taking care of the very restless Baby Rain, and offered to take care of her. Within minutes she had a crowd gathered around her. My Baby Girl is such a Superstar! you should try this place, cookies! yep we're the same, Guia! Everything looks really delicious, Richie. I will visit this place soon. 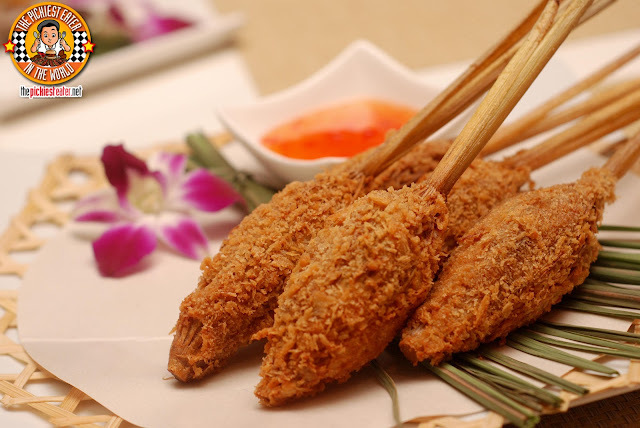 The crispy catfish and the black soft shell crab looks awesome! 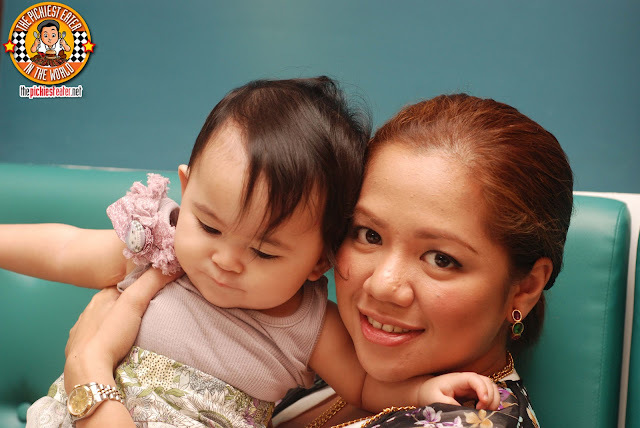 You know, aside from the pictures of the food you eat, I follow your blog because of Baby Rain hahahaha :D sooooo cute!!!! 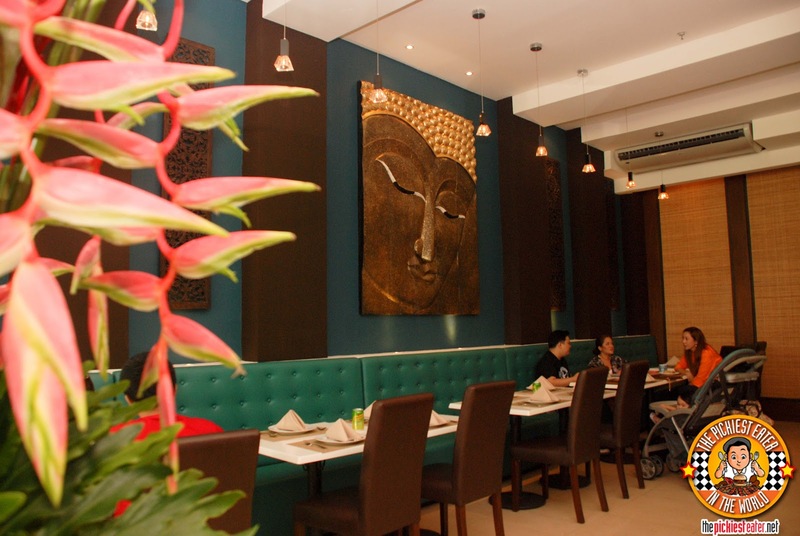 During my first visit at Thai Bistro, I was actually amazed about its sophisticated ambiance. You can see different Thai related ornaments which will indeed make you feel that you’ve gone instantly to Thailand. The restaurant can host or accommodate 52 people inside, and 70 people outside. thank you for the good review..so proud of THAI BISTRO..
One of my favorite thai restos of all time!